Have fun, learn about Hawai’i and stay fit. Come Hula with Sirena!!! Classes are designed for students within their age group. 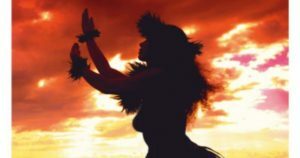 Students will learn a range of Hawai’ian dance arts, some Tahitian rhythms and fitness and health knowledge. Nereida La Sirena has a Master’s in the History of the Latinos through Music and Dance. Sirena has been dancing and performing a wide range of styles and genres all her life. While doing her Navy Reserve time at NTCC Pearl Harbor for several years, her interest in Hawai’ian Hula peaked once again. (Sirena’s first exposure to Hawai’ian Hula was back when she was 6 years old). Most recently, Sirena has been dancing as a member of Ku’uipo ‘O Hula for over 5 years. Now, Sirena is taking her Health Coaching & Nutritionist Knowledge, and Mastery of Yoga combining it with Hawai’ian Hula to offer fun, fitness and health informed classes.